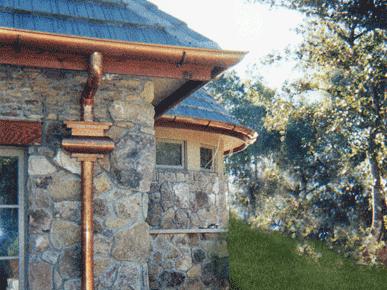 There are several types of gutters based on materials, styles, and shapes. If you wish to replace or install new gutters, knowing the different types will help you make an informed choice. Here are different gutter profiles and their applications. Once you learn the different types, then you can make the right decision on the ones to install in your home. K-style gutters are the most common profile. The K does not refer to their shape. It is based on an alphabet listing by the national association of metal and air conditioning. The letter K merely is number eleven on their list of gutter profiles. This gutter style has a decorative appearance. They are also referred to as ogee gutters. K-style gutters are ideal if you want a seamless finish. This gutter style is also less prone to leaks. They come in a variety of sizes and can fit many applications. As the name implies, these gutters resemble a half circle. The open half part faces the roof. These gutters are mostly seen in old and historic homes. Half gutters have several challenges due to their shape. They do not work as well as the k-style gutters. They have half the capacity of K-style gutters. Debris in the gutter can quickly stop the flow of water. When installing half round gutters, the gutter hangers are placed under the gutter making them visible. A fascia gutter is a combination of the fascia and the gutter into one system. These gutters are installed in homes where the traditional fascia boards are missing. Fascia gutters have a smooth face, this performs the tasks of the boards and hides the rafter tails and edges from view. These gutters are mainly used in residential homes. They come in a range of colors, and some have a slotted finish. If you live an area with heavy rainfall, you can go for the slotted ones to deal with the excess flow of water. These are commonly known as euro-gutters. They are stylish half round gutters, a contrast to the open box profile. The gutter bead on these style turns to the outside and not the inside. The gutter miter or fittings are seamless. The end-caps are also smoothly rounded. The euro gutters are mainly preferred for their aesthetic value and durability. They can hold in extreme weather conditions. European gutters have a wide circumference making them conducive for efficient water flow. Due to the concave floor, these gutters are less accommodating to birds, mice, rats, and even raccoons. Gutters function better when you install gutter guards. The guards help to filter out debris and prevent clogging. By installing these protective guards, you also save on the time and effort needed to clean gutters and untimely repairs. Learn the different type of gutter guards and select the right one for your home. The selection is also made easier when you know what to look for. Mesh guards are made of mesh and metal sheets. The tiny holes do a good job in filtering out debris and at the same time drawing water in. A square inch of a gutter has hundreds of small holes. Many homeowners prefer mesh gutter guards because they can be installed on many types of roofs and gutter profiles. These guards are also popular because they are durable. Mesh takes longer to deteriorate when compared to other materials. If you are planning on installing new guards, mesh guards are considered a sound investment. Bottle brush guards are cylindrical, and they look like the wire cleaning brushes. These guards are best for filtering out the large leaves and debris. The spikes in the guards allow for ease of air circulation. This dries the gutters and prevents rusting. Screen gutters are made from plastic or metal. They are widely available and affordable. They are also easy to install and clean. The screen protection helps to filter out debris. If you are looking for better filters, mesh works better when it comes to small debris. Screen guards can also rust and stain your house. To avoid rusting, you can go for the plastic versions. Screen gutters are too light, and they can be blown off when there is a strong wind. As the name implies, these guards have a curve that is reversed. The design helps to prevent leaves from getting into the gutter and also allows for debris to fall on the ground. The gutter guard has side slots and a solid cover. Reverse gutter guards are installed to follow the natural slope of the roof. This allows water to flow freely without obstructions.